Haneda Airport is the main domestic airport for Tokyo. 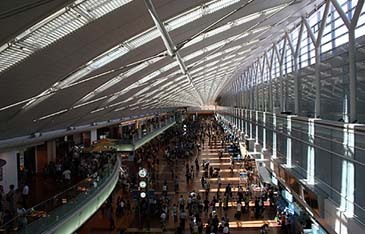 Haneda Airport is also known as Tokyo International Airport. Government of Japan has recently issued new procedures applicable to foreign nationals at arrival in Japan with effect from Nov. 20, 2007, and not at the visa application stage. As per these procedures, fingerprints will be scanned and a facial photograph will be taken at the arrival in Japan. Exempt from the new measure are "special permanent residents" of Korean and Taiwanese descent who had Japanese nationality before the end of the war and their descendants. Also exempt are diplomats, children under age 16 and those visiting at the invitation of the government. Foreigners with permanent residency status will be obliged to submit to fingerprinting every time they enter the country. If foreign nationals who are not eligible to exemption from these requirements refuse to submit their fingerprints or photographs, they will be denied entry into Japan and ordered to leave. Despite the Japanese government claims it is necessary to counter terrorism, a new immigration procedure obliging most foreigners to be fingerprinted and photographed upon entry to Japan has come under fire as an unwarranted invasion of privacy. Critics also contend the new policy will result in even longer waits at immigration control gates. More to the point, experts doubt whether it will even stop potential terrorists from entering the country. Under the procedure, visitors whose biometric data match those on confidential terrorist watch lists will be denied entry to Japan. The lists are believed to include one compiled by the U.S. government and contain the names of about 750,000 "terror suspects." Justice Minister Kunio Hatoyama has said Japan will cooperate with U.S. authorities in exchanging immigration data.